Metal spikes are not allowed on most courses, so you'll need replace them. If there ever was a game that required stability, golf is that game. So the spikes on a pair of golf shoes are a very important part of a golfer's equipment. Whether you find your ball on the fairway or rough, golf spikes can help you maintain your balance throughout your swing. Your spikes undergo a lot of wear and they should be maintained to ensure their reliability. They should be cared for and changed much more often than most golfers realize to ensure solid footing and many years of use. Make a routine of replacing your metal spikes based on how often you play. For instance, if you play every day, you should change your spikes once each month. If you are only a weekend player, you should change them at least twice each year. Today, because greens-keepers have realized that metal spikes damage greens, most players are required to wear soft spikes that are made of plastic or rubber. Because they are subject to greater wear, a daily player should replace them about every three weeks, and a weekend player about every three to four months. 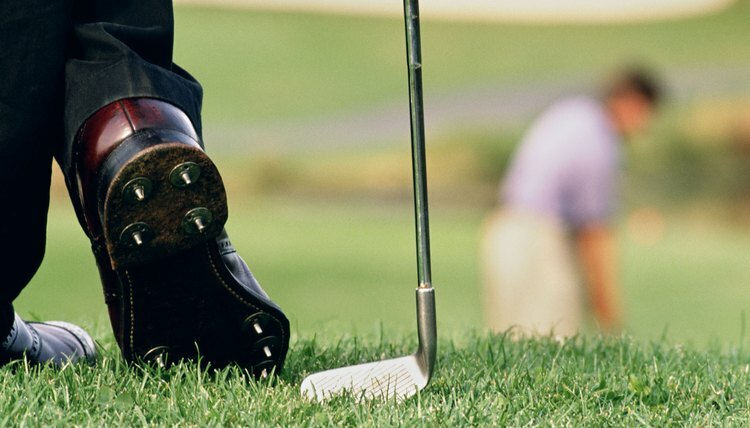 Learn the proper way to replace the spikes in your golf shoes. First, you should remove all the accumulated dirt from the bottoms of your shoes. Then, using a specially-designed cleat wrench that is sold in most pro shops and sporting stores, remove your cleats by turning counter-clockwise. Make sure that each hole is also free of debris to ease replacement with new spikes. Insert the new spikes into the holes using your wrench, making sure that each spike is firmly in place. Finally, improve the overall look of your golf shoes by freshening up the uppers. Your game might not improve but you sure will look better. Always keep spikes on hand. Since you will be replacing the spikes in your golf shoes more often, always have a supply of cleats available. Also, change all of the spikes in your shoes at once, rather than simply replacing worn ones because by doing so you will change the composition of the shoe. Keep up with breakthroughs. Everyday, adaptations of plastic spikes come to market to improve a golfer's stability. Among them are spikes that include a special grit that makes them adhere more to grass.